10 Cloverfield Lane is a concoction of several other movies but unfortunately not as good as any of them. Right off the bat, I detected elements from Night of the Living Dead, Panic Room, 28 Days Later, War of the Worlds, and of course, Cloverfield, of which this film is sort of an extension. We can assume the events that take place in 10 Cloverfield Lane run parallel to those in Cloverfield, the found footage movie about an alien monster that attacks New York City. 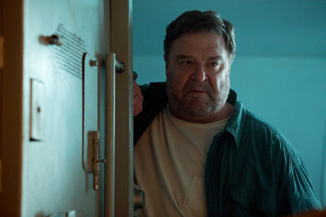 10 Cloverfield Lane is also about an attack on Earth, but rather than this being the main subject, it merely serves as a catalyst for a more enclosed and human plot. Other differences are that 10 Cloverfield Lane takes place in remote farm country outside Lake Charles, Louisiana, and instead of being told in a found footage style, it’s a traditional narrative with clearly defined scenes, cuts and montages. This approach doesn’t detract from the film’s attempted effect, necessarily, but it does remind us what made the first Cloverfield so unique. The story opens with Michelle (Mary Elizabeth Winstead), a woman of about 30, packing and leaving her apartment in a hurry after she and her boyfriend had a fight. Anxious and desperate, Michelle hops into her car and starts driving. She ignores phone calls and remains unaware of the events happening outside. Suddenly, another vehicle strikes her and runs her off the road. Despite the film’s eventual shortcomings, I will say the car accident scene is executed extremely well and really puts us in the driver’s seat, so to speak (for anyone who’s ever had the unfortunate experience of being in a similar accident, it rings all too true). If anything, it gets us excited because we hope the rest of the movie might be just as intense and visceral.